Do you want to provide safe, effective massage therapy for people with cancer and cancer histories? How can a course and case scenarios help you offer oncology massage with confidence? More than 1.5 million new cases of cancer occur in the US alone each year. In increasing numbers, people with cancer and cancer histories seek out massage for support, symptom relief, corrective touch, and healing. Massage therapists are often caught between the heartbreak of turning away someone who needs help, and the uncertainty of how to work with them safely. In massage school, you might have learned that massage would spread the disease, or you might have heard later that cancer was a flat-out massage contraindication. Perhaps you were told that massage could be done with permission from the client’s physician. Or maybe you figured it out on your own, but you’ve worked in isolation, without support or reinforcement of your skills. For dates, locations, and tuition, see our training schedule. For CE course approvals, check here. A 4-Day Intensive and supervised peer practice clinic (a new format for our clinic in 2016) to help you work safely and effectively with people with cancer and cancer histories. This course gives you clear step-by-step directions for working with clients with cancer and cancer histories. You receive specific “decision tree” diagrams rather than vague verbal instructions. We show you how to use the client interview, and common cancer resources to design the safest, most effective massage. Learn what to do for clients during cancer treatment, the years post-treatment, and even some lifelong guidelines. Leave with forms and intake questions, a “side effects table,” and even a sample oncology massage care plan to share with a client’s physician. Use our principles and tools to work with people with cancer in any setting, from hospital to franchise. Even seasoned oncology massage therapists have used our strategies to practice with greater ease and success. Our instructors have cleared a path. We know the territory well, and we’ve taught thousands of therapists to navigate it on their own. Hands-on practice is artfully mixed with discussion and lecture. Varying approaches to the work — meditative, cognitive, kinesthetic, visual, emotional, auditory, intuitive — are honored throughout the course. 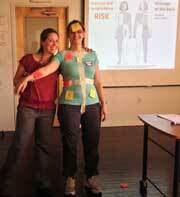 A safe learning setting allows therapists to build lasting knowledge and skills. A highlight of the course — our Peer Practice Clinic — offers a chance to practice skills in a supervised clinic setting. The goal is to create hands-on sessions that soothe, heal, and reduce pain and isolation. This is an intensive course, packed with information. We make it manageable by varying our format, teaching style, classroom setup, and pacing. We are sensitive to students of all backgrounds and levels, and encourage questions and discussion. Massage therapists from varying backgrounds give the course outstanding reviews. Before you sign up, we encourage you to read on. Check out the rest of this page and the FAQs below. That way you'll have a good sense of all that we cover, how we cover it, and how you can be prepared. New in 2016: A “Peer Practice Clinic” In a peer practice clinic (PPC), students pair up and work with each other in two supervised sessions on the final day of the course. Using realistic client case scenarios, each student gives an oncology massage to a fellow student and receives an oncology massage from that student. With teacher support and supervision, students practice interviewing, communicating with a client, and adapting massage therapy to cancer symptoms and side effects of treatment. In 2016, this simulated clinic format, with students participating in two hands-on sessions, replaced our former “traditional clinic,” which was a single practice session with an actual oncology client volunteer from the community. Read more about the course, topics, teachers, and FAQs here: https://www.tracywalton.com/4-day-intensive/. Or read on, if you like more detail. How can this benefit you and your practice? Correct old myths about massage and cancer. Earn clients’ trust by explaining how skilled massage therapy will not spread cancer. 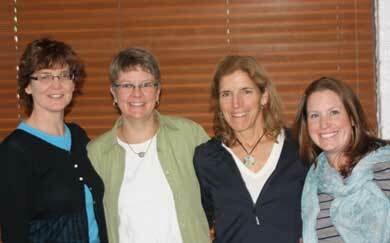 Build your practice and join the expanding specialty of Oncology Massage. Qualify for membership in the Society for Oncology Massage (s4om), and listing in the worldwide therapist locator service. Open your practice to a population that needs your work. Work safely and effectively with people during cancer treatment. Modify massage using an innovative massage pressure scale, already in use in hospitals and cancer treatment centers. Use “The Four Medication Questions,” to adapt massage to hundreds of cancer treatments (and without memorizing volumes of information). Work confidently with clients post-treatment. Know which side effects of cancer treatment can last a lifetime, and how to modify massage to avoid aggravating them. Use “The Quadrant Principle” to work worry-free with clients who are years out of treatment. Build alliances with oncology clients and health care professionals. Leave with time-saving intake and physician communication forms. Learn when and how to communicate with the client’s health care team. Use our plain and simple scripts to teach clients and health care professionals about oncology massage. Manage complex health information with ease and confidence. Use a simple “Decision Tree” to work with oncology clients as well as other medical conditions such as diabetes and heart disease. Apply a handful of easy-to-use principles, rather than rote memorization of information, so you can focus on your hands-on connection. Work compassionately, with full presence. Through hands-on exercises, experience the soulful impact of skilled touch, and the power of your simple presence in service to your clients. Written massage protocols for a wide range of client presentations. You’ll have guidelines for tumor sites, bone involvement, and vital organ involvement. You’ll know how to modify massage for surgery, radiation therapy, chemotherapy, biologic and hormone therapy. You’ll leave with these in hand, in our manual, with clear explanations of when and how to use them. Hands-on practice of key massage protocols. You’ll practice a non-circulatory massage protocol, and techniques to use with a client who is ill from treatment or late-stage disease. You’ll learn a massage protocol for clients with elevated blood clot risk (which applies to many people in cancer treatment), and another for people at risk of lymphedema. We’ll help you line up your massage pressures with our 5-level pressure scale, for consistent pressure guidelines in cancer and cancer treatment. A primer of ten “Radical Bolstering” techniques for easing symptoms and promoting sleep. When we first introduced these in the classroom, we had no idea how much fun they would become. Requiring no commercial bolsters, these wildly popular supports go beyond those introduced in massage school. Learn how “nested bolsters” and evenly-placed supports can make a huge difference in comfort for this population, and use the principles to create your own supports. Essential information about lifelong tissue changes caused by cancer treatment, and guidelines for modifying massage post-treatment. Work safely and confidently with your clients who are years or decades out of treatment. Learn how to adapt massage to changing tissues over time. Interview questions and a client health form for your client intake. Learn essential questions for clients with cancer and cancer histories. We tell you what to ask, suggest how to ask it, and show you how your client’s answers require you to change how you massage. Set of Principles of Massage Contraindications. Simple principles eliminate the need to memorize huge volumes of specialized medical information. You’ll receive these with examples of when and how to apply them to common client scenarios. Each principle can be used for hundreds of different client cases. ‘The 5-level “Walton Pressure Scale.” Used at hospitals and cancer centers around the country, this simple scale can help you chart better, describe pressure to clients and physicians, and work more safely with people with cancer and cancer histories. Because most massage contraindications involve pressure adjustments, you receive hands-on instruction, illustrations, and written descriptions of essential pressure modifications. Exercises in quiet reflection and full presence. We begin each day, and many of our hands-on sessions, with inspiring words, images, and deep reverence for our experiences of cancer and touch. We give each other the gift of “easy silence,” and receive each other’s truths without judgment or analysis. Each person is made welcome, at their own pace, to tap the depths of their personal experience for the strength, love, and healing to bring to their hands-on work. Sample scripts for talking with clients about oncology massage. Use our samples of sensitive communication to teach your clients about adapting massage to cancer and cancer treatments. When the need arises, gain their support for lighter pressure and other massage precautions. Practice setting thoughtful limits, while maintaining rapport with your clients. A “Side Effects Table” and a quick, easy way to identify massage precautions for most medications and cancer treatments. We’ll show you the method. 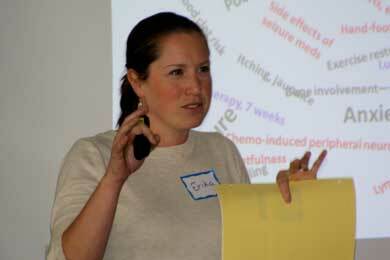 In class, you’ll pull together massage modifications for common side effects of chemotherapy. Together we’ll discover how easy it can be to make a massage plan and explain it to the client, no matter which medications they are taking. Sample forms and tips for communicating with your client’s physician. We’ll give you sample correspondence that you can customize for your own use. A physician approval form, some thoughts about how to make it work, and a sample oncology massage therapy care plan. A supervised, hands-on peer practice clinic. In a peer practice clinic (PPC) on the final day, you will be paired with a classmate to participate in two simulated clinic sessions. You will be given two realistic, in-depth oncology client case scenarios. In one simulated session, you work as the massage therapist, and in the other, you take on the role of the client and receive massage. In the role of the MT, you will interview, develop a massage plan, and carry out a hands-on session just as if your partner were an actual client with cancer or a cancer history. In the role of client, you will be given your health history, and directed as to how to answer interview questions before receiving an oncology massage session from your partner. In both cases you receive written support for your role, and you will be supervised by your instructor. A 190-page training manual, plus other written materials designed to support your practice well beyond our 4 days together. You don’t have to take many notes. Plenty of illustrations and resources for later. A Certificate for 32.0 CE hours. If you attend the entire course and participate in the activities, you receive a certificate of completion. We are NCBTMB approved. Click here for the full list of course approvals, including Florida, Georgia, and New York. Eligibility for Society for Oncology Massage (s4om) membership. The Society for Oncology Massage recognizes our 4-Day Intensive course as first step toward membership, which includes listing in the worldwide oncology massage therapist locator service. Massage therapists use science, art, the heart, and the body. We provide technical information about cancer, cancer spread, blood clots, bone involvement, chemotherapy, and many other topics. We link that information directly to massage practice, with hands-on protocols and interview questions. So yes, it’s technical at times. Yet throughout, we hold massage therapy close to our hearts. We make it all applicable. We spend time with touch, including the ways our hearts are touched by our work with people. Somehow the combination works. We teach in a way that is fun, and you don’t have to cram in a lot of memorizing. While the course earns its name, “4-Day Intensive,” we make it manageable and fun. The manual and handouts save you from rapid note-taking, and we use learning shortcuts where possible. We put the “book learning” directly into practice in case studies and hands-on exercises. We address a variety of learning styles: visual, kinesthetic, and auditory. We use a principle-based approach instead of piles of information to memorize. You can apply a handful of principles to any cancer scenario in any setting. For example: There are four short questions to ask about any cancer drug, and each question is linked to a logical massage guideline. In a peer practice clinic (PPC) on the final day, you and a classmate have the opportunity to apply and strengthen your skills in interviewing, client communication, and hands-on work with oncology clients. You put all of the work and concepts of the previous three days into practice. In the peer practice clinic, you and a partner work through two realistic client case scenarios. In one, you work as the MT, and in the other, you take on the role of the client. Each case requires depth, the need for follow-up interview questions, and massage modifications. In both cases you receive instructor verbal feedback and written support. The peer practice clinic is a carefully planned event, scheduled for the final day of the course. We prepare behind the scenes so that you can have an optimal learning experience and sail into it with confidence. Prior to 2016, students practiced on actual client volunteers with cancer histories in a single session. Left to chance, we found large variability in student learning experiences, with some students working with medically complex situations and others encountering much simpler scenarios. We adopted this new format in 2016 in order to standardize our students’ learning experiences. 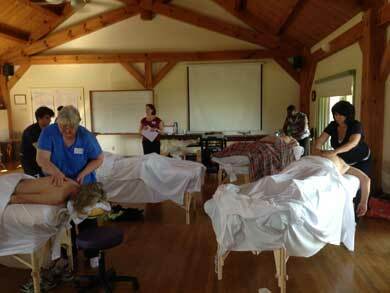 By taking on the client role as well as the MT role, students experience both sides of oncology massage. As well, each student has the opportunity to learn from two clinic sessions, rather than just one. The peer practice clinic is not a test. It is a chance to practice and get your questions answered in a supportive environment. Our realistic client case scenarios have been well developed in advance of the course. They are given to you in advance of the clinic. This means you have a chance to meet your simulated “client” on paper before your peer practice clinic. It also means you can prepare for your peer client ahead of time, developing a preliminary massage care plan. You can identify massage precautions, write down interview questions, and rehearse some new skills before the clinic. During the peer practice clinic, your supervisor is available for reinforcement and support. You also have the opportunity to be the peer client in a second realistic client case scenario. Post-clinic, we have a roundtable discussion where you can learn from your classmates’ clinic experiences, as well. Our instructors have hundreds of hours of oncology massage behind them, and each one is full of client cases to share. They’ve been through rigorous training as well as many hours of classroom experience. Our instructors have strong classroom management skills, keeping our groups focused on task. They are friendly, approachable, and humble. Each instructor has a unique brand of humor and wisdom. They share a deep joy and satisfaction in their work, and they love teaching about it. Read about each instructor and background on the Meet our Teachers page. What about the emotions that come — will I be able to handle working with people with cancer? Will I be overwhelmed in this course? If you share this concern, you are in good company. It is a common question. In our experience, answering these questions is a sacred and individual process. We each answer them for ourselves, and the answers come from inside. In this course, we offer you thoughtful support for your experience, but we stop short of telling you what’s true for you. These are some of the most important questions we face in this kind of work. In fact, they are way too important to answer in a sound bite, a lecture on boundaries, or a short list of self-care tips. Instead, we encourage patience with these questions, as they unfold. We support each student wherever she or he is. We welcome the full range of experiences that come up around cancer, cancer treatment, and touch. We find that everything on the spectrum — from laughter through tears — can pop up in 4 days. Over the years, we’ve observed that a room full of MTs learning oncology massage tends to be a most excellently supportive group, and you are likely to find good, solid company in whatever arises for you during the course. 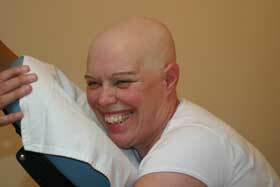 In our experience, doing oncology massage therapy requires good support. That support may start in a classroom, but for many therapists, supervision of some sort is vital to their work, and to managing what comes up for them. You may leave this course with a resolve to meet regularly with some classmates, in an ongoing peer support. Oncology massage can be used anywhere. People ask us where they can apply the skills they learn in this course. Participants have put the work to use in hospital settings, home care, spa or retreat settings, outpatient clinics, private practice, franchise and hospice facilities. In on-site massage and other high-volume settings, skilled oncology massage therapists can work without worry or concern. Repeatedly we are told how well-prepared they feel. — Rebecca Auclair, Moretown, VT. In massage school, back in the late 80’s, I learned cancer contraindicated massage because massage might spread it. It never quite made sense to me, but I was brand new to the field then, and it seemed premature to question it. I learned it for the test. After graduation, I went to work in a busy spa and built my private practice. I found out quickly that people with cancer gravitate toward massage therapy, even when we’re ill-prepared to serve them. In my case, people in cancer treatment arrived almost immediately in my practice, specifically searching for healing touch for the journey. In my other life, teaching physiology and pathology in a massage school, I was facing down students who had the same questions I had about massage and cancer. The need was clear, and I felt foolish and a bit lost. But I also felt a deep calling to make massage work for this population. So I rolled up my sleeves and taught myself how to work safely with them. I dug out my cell biology textbooks from grad school. I read everything I could find on the subject. I asked advice. I met up with Gayle MacDonald, first, then other leaders in the field: Cheryl Chapman, Debra Curties, the MTs at Memorial Sloan-Kettering, MD Anderson. I took courses with Irene Smith and Dawn Nelson. I read and took part in research on people with metastatic cancer. I learned and learned. And my clients taught me the most. They taught me about cancer, treatment, pain, healing, and triumph. On every imaginable level. They taught me that touch is a birthright, not an indulgence. They taught me that the relief and comfort that came from skilled touch were worth working hard for. My clients taught me that touch could reach across isolation, stigma, and pain, and join people together. My heart filled to overflowing. Eventually the body of work grew, and it became a system that I could share with a wider audience. This course started as a small study group in 1998, and it grew quickly to a 3-day course in 2000. People demanded more, we listened, and in 2011 it became a 4-day course. (That year, I also authored a general pathology textbook. 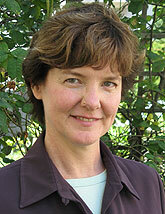 Today we have an outstanding teaching staff with decades of teaching experience and oncology massage practice. We’ve worked in hospitals, community centers, research settings, fundraising events, and private client sessions. We’ve taught thousands of massage therapists. We’ve taught in massage schools, spas, community colleges, conferences, and over the web. The landscape is very different than it was when I started. A sea change has occurred. It continues. We are joined in our efforts by the Society for Oncology Massage. As vast as its reach is, oncology massage remains a compassionate, unassuming field, driven by the hearts and soul of hundreds of caring massage therapists, and mindful of its humble roots. It is a wonderful community of practitioners, and I’m proud to be a part of it. Most of our sponsors offer early registration at a substantial discount, and earlier registration is recommended. Our courses fill quickly, often weeks or months in advance. Register soon if you want to ensure a spot. We are hosted by various sponsors, with varying published withdrawal and refund policies, so check with the sponsor or look at the event details on our training schedule for the withdrawal policy at each site. As far as refunds go, we want MTs to receive what they need, and meet the written objectives of the course at each site. If for some reason you are not satisfied with our 4-Day Intensive Oncology Massage Therapy course, please let us know. We want you to learn what you need to learn. If you attend the entire session, participate fully in the exercises, and apply yourself at the peer practice clinic and you are still unhappy with the course, then talk with your sponsor about it. Or, if we self-sponsored the course, talk with us. Sample scripts for talking with clients about oncology massage. A fast, easy way to identify massage precautions for medications. Instructor verbal feedback and written support before the peer practice clinic. 32.0 CE hours, NCBTMB-approved, click here to see the full list of course approvals. Find out from the training schedule page by clicking on “More Info” next to the offering you are interested in. Different policies may be in force at different training sites. If you register for the course through us, you'll find the withdrawal and refund policy in the “More Info” box. If you register through a massage school CE program, click on the link to their CE website for their withdrawal and refund policy. Will you take a deposit, and can I pay in full at a later date? Some of our sponsors (the massage schools and cancer centers who host us) are set up to do this. If you register for a course sponsored by a massage school or other facility, ask the sponsor what the terms are and if they can accept a payment plan. We are not set up to do this when you register with us directly through a “Register” button on our training schedule. Although we need payment in full at the time of registration, when you register with us, you may be able to pay through PayPal credit, which offers 0% interest and 0 payments for 6 months. Click on the PayPal Credit banner to learn more. PayPal Credit is a new offering through PayPal, with no interest or payments for 6 months. You'll have the option to apply when you register. Click on the PayPal banner at right to learn more. Do you offer scholarships? Discounted tuition? We do not offer scholarships or discounts through our office. May I miss the first few hours? Or the last day, the last few hours? In a word, no. To receive the certificate of completion for 32.0 CE hours, you need to be present for all of those CE hours. And clinic participation is an absolute requirement for membership in the Society for Oncology Massage. We count on you being there for the full length of the course. Please schedule your travel plans around this. What is the daily schedule? I am concerned about …(fill in the blank — child care, pet care, elder care, airline schedules, my body holding up for 4 days). The usual day is 9-6, but this varies by location. Sometimes it is 8-5, or hours are shifted around classroom space schedules. To find the daily schedule of the course you are interested in, go to the Training Schedule page. Times are listed in each training's event details. We have had students with physical concerns such as a back problem, injury, or chronic illness. In general, they tell us they tire after long days, but some feel energized, as well. The hands-on techniques tend to be gentler and easier than the usual heavier pressures. That said, it's an intensive course, with long days, and a peer practice clinic at the end. In particular, Day 2 tips the balance toward desk-learning more than table-side learning. We need you to be there and engaged, all 4 days, participating in all hands-on lessons. Because it's a long course and a serious commitment — you know when you should or shouldn't push yourself. May I record the course? You are welcome to make an audio recording of the course for your own personal use. Short video segments, such as hands-on demonstrations, are also fine for personal use. Nothing longer, or we'll have to worry about wardrobe and hair. And please do not post/publish recordings online or use them for any other purpose, without written permission from us first. English is my second language. Will I be able to get what I need from this course? The best way to answer this question is to look back at your learning experience in massage school. If your language skills were strong enough to succeed then, you are likely to succeed in this course. We teach using visual aids, extensive handouts, and hands-on practice. You will have to take a few notes, but most are written down for you. I have a hearing (or vision) impairment. What steps do you take to make sure I can learn? Please let us know well in advance, so we can assist you. For some situations, we need weeks or months lead time. Registrants with visual or hearing impairments, or special learning needs are asked to contact Tracy Walton & Associates in advance of the workshop and identify themselves so that the environment serves your learning needs. Graduation from at least a 500-hour professional massage therapy program or equivalent. Advanced students who have completed pathology coursework and some clinical experience, by approval of the instructor. Other health professionals may register, but check with us first to make sure it is a good fit. Approvals? Are you approved by NCTBMB? In my state? Please click here for 4-day Intensive course approvals. We are not currently approved for nursing CEUs in any state. What are the next steps, after completing the course? Do you have more courses to take? For those wanting additional support in building an oncology massage practice, we have a small-group Advanced Mentorship Course. Those wanting an occasional refresher can view our many webinars that reinforce the skills and concepts you learn in the course. There are two series on cancer care and massage, and one on hospital-based massage therapy. Do you teach lymphatic drainage? I want to learn how to treat clients with lymphedema. Which training should I take? Which ones will certify me? We do not teach MTs how to treat lymphedema. Lymphedema care requires many of hours of training in manual lymph drainage (MLD) and theory. MLD is a highly specialized modality that involves bandaging as well as manual techniques. You'll need to get that training elsewhere. We have a few thoughts to guide you in that search here. In our 4-Day Intensive, we teach how to adapt conventional relaxation massage techniques in order to work safely with people who have lymphedema, or are at risk of it. We cover this thoroughly because, done incorrectly, Swedish massage techniques can aggravate or trigger lymphedema. So we show how to avoid injury. Do you cover the research on massage and cancer in this course? While it is not explicitly covered in the 4-Day Intensive, we cover research elsewhere in our webinar series, “Cancer Care and Massage Therapy.” We feel strongly that if oncology massage therapists offer massage research to promote the work, that we are better off with the strongest studies out there. In this webinar, we review several key studies in oncology massage, look at their strengths and weaknesses, and discuss how to use them in our promotional materials. I want to work with children with cancer. Do you cover pediatric oncology massage? Again, yes and no. You'll take away principles from our course that you can use with many populations, including children with cancer. However, if you have a special interest in pediatrics, we recommend you take one of the fine courses available in pediatric massage, especially for children with special health needs. Can you help me start a program in a hospital? Yes and no. We can help you with some of the skills, but not the program development part. Because hospitals often look for oncology massage therapy skills when they hire, it's important to have those skills, and this course is one foundation. If you want specific information about starting or building a MT program in a hospital, or how to work within hospital culture, you will want to take a hospital-based massage training where you can practice hands-on work within a medical center. There are several listed at the s4om website. You will not find these topics in our 4-day course. 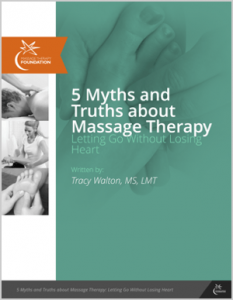 If you'd like a lot of hospital-based massage therapy wisdom in one place, we have a popular webinar series in which Tracy Walton interviews 5 hospital-based massage experts, with about 75 years of experience between them. They share survival tips, business models, and plenty of wisdom about the work. I want to work in hospital. Are there hospital jobs out there, and will this course prepare me for them? To our knowledge, no one is tracking employment in oncology massage or hospital settings, so we do not have any data to provide you on this front. The closest we've seen to meaningful data is an AMTA white paper, “Working in a Health Care Environment.” Many MTs take courses in oncology massage or hospital-based massage hoping to gain employment. Some arrive at the course with the support of a hospital wanting them to launch a program upon their return. Others have great luck reaching out to hospitals after taking the course, and are launching programs, volunteering, or even working in hospital settings soon after they take the course. Still others try for years to get employment or develop an MT program at a local hospital, with no success. Experts in hospital-based massage tell us it's often really difficult to get things started. In our webinar series on hospital-based massage, they shared valuable insights and information, but also told us about challenges and obstacles along the way. If you want to work in a hospital, you will need to be persistent, patient, and prepared. There is no telling what awaits you after taking this course, or any other. However, if you have hospital massage aspirations, oncology massage training is an important part of your preparation. Why? If you take a foundational course, you are ready to get hands-on practice at home, and in whatever setting you work. If you have hands-on experience behind you, you are more likely to be ready when a hospital-based massage opportunity arises. Most of our curriculum can be applied to the hospital setting, including hands-on massage adaptations, clinical reasoning skills, bolstering techniques, and tools for communicating with medical staff. Some of our students come from hospital settings already, and some start with us, then go on directly to work in hospital settings. That said, there are many fine hospital-based massage programs, some of them listed at the Society for Oncology Massage. Requirements vary, but you're more likely to succeed in a hospital-based massage therapy course, after a good foundational oncology massage course. Are there jobs available in oncology massage? The number of jobs specifically in oncology massage is unknown. There is no real data on this question. But people with cancer and cancer histories seek out massage in every setting. During treatment and post-treatment, clients look for massage support from spas, franchises, massage schools, clinics, and therapists in private practice, whether or not the therapists are prepared to see them. And if you do want to specialize, oncology massage is a good niche. There are not enough massage therapists doing the work. Increasingly, jobs are showing up in hospitals, spas focused on cancer care, and other settings where specific oncology training is needed. In 2014, the National Center for Health Statistics projected more than 1.5 million new cancer cases. If you are prepared to see people with cancer, using care and skill, there is work for you. Will this course really prepare me to work with people with cancer? Our students tell us overwhelmingly that it does, and they turn around and use their training the next day in their private practice, hospital, clinic, franchise, or spa. They tell us they can not only manage the cases we covered in class, but also apply the principles and skills they learned to unfamiliar client cases. We love hearing this, again and again. The information and skills are immediately usable. I have a client who’s been out of cancer treatment for a year. Will we learn about massage adaptations for cancer survivors, not just people with active cancer? Yes. There are several critical adaptations to massage that are necessary for years, even decades after cancer treatment. Some are lifelong contraindications. We introduce these in the course, and even practice some of the hands-on modifications. Will I be able to work in any cancer setting after this course? Course participants have gone on to work in hospital settings, home care, spa or retreat settings, outpatient clinics, and hospice facilities. They tell us repeatedly how well this course prepared them for those settings. Is any advance preparation required for this course? There are a few videos for you to view ahead of time. In advance of your course, we'll send you links to download them for free. These videos are required, and they introduce you to the knowledge base and systems we use in oncology massage. There is an article, as well, to uplift and inspire. We also suggest two textbooks, one by Tracy Walton and one by Gayle MacDonald. The textbook purchases are optional, but we send you information about discounts where applicable. Will this or another course “certify” me in oncology massage? Are there any shorter, less expensive alternatives to the 4-Day Intensive? We offer two webinar series on massage and cancer, and individual webinars on demand. These are great ways to try out our work. But nothing replaces a face to face course, with multiple hands-on practice sessions and a supervised practice clinic. Using this formula, our teaching team and sponsors provide a wonderful learning experience that is hugely popular after more than 15 years of fine-tuning. Our students tell us they learned and grew on all levels. This course seems expensive to me. Why does it cost what it costs? Although the price per CE hour is pretty standard, it can add up when you multiply by 32.0 hours! There is plenty of individual attention, from highly skilled faculty. We have a high faculty to student ratio, and superbly trained faculty. Learn about the instructors here. You leave with high-quality training materials — over 200 pages of usable, re-usable, in-depth information and resources. We consistently hear from students that our training manual is the best they've seen. In a word, the peer practice clinic, and the preparation behind it. The best learning comes from a supervised practice clinic, with case scenarios for clients with cancer histories. A practice clinic is uncommon in CE courses, and some clinics are thrown together in haste. But we put a lot of thought and preparation into ours. The rewards are great: Our students consistently tell us these things sealed their learning experience. They have the confidence and skills to apply what they've learned. Is individual help available during the course? We plan for you to receive individual help throughout, as needed. We are accessible and open. You can catch us on a break or after class for questions. I’ve already taken __________’s class in oncology massage. Will this be redundant? Many MTs train with more than one oncology massage instructor, to deepen their experience in this specialty and to hear additional perspectives on the work. We all have slightly different teaching styles, and different approaches to common concepts. For depth and the variety, we recommend attending more than one oncology massage training. Yes, expect some overlap if you've made the rounds of courses. Yet those who have taken multiple oncology massage courses tell us ours was a joyful review rather than tedious repetition. We welcome you in our class. There are several oncology massage courses to choose from. How is yours unique, and how do I decide which to take? It is one day longer than the minimum 3 days required by the Society for Oncology Massage. Even so, it's packed. After 15 years of teaching this to thousands of people, we see what's essential to doing this work well, and we need 4 days to get it all in. We are told that we “teach people to fish,” rather than giving them fish. We teach principles and thinking processes, not just information. We do this for two reasons: (1) It cuts down on the information you have to memorize (big hooray there). (2) Instead of memorizing a huge range of cancer presentations and massage precautions, you leave our course with the tools you need to manage that range of presentations. This saves you and your clients time and grief, there is less fumbling for information. The system we offer works with other common conditions, too. You'll have a framework for conditions such as diabetes, stroke, cardiovascular disease, liver and lung disease, and even osteoporosis. You are likely to come away with new material, a fresh perspective, and some useful tools for your general practice. Our hands-on instruction includes practical tools, and we focus on the heart and soul of massage therapy. We teach bolstering and positioning techniques that we have found, in practice, to be essential for client comfort and pain relief. Our peer practice clinic is carefully structured and prepared, down to the last detail. How is the 4-Day Intensive different from your webinars or other online courses? Can I get this material in less time, or online? This is a face-to-face course with a peer practice clinic, offered in real time, with hands-on instruction, exercises, and Q&A in an interactive environment. In contrast, our pre-recorded webinars are self-paced, there is no interaction with the instructor, and obviously no hands-on instruction or clinic. In our short online courses, we are able to share some important information and concepts about massage and cancer, but we are limited to that. There is no chance to build skills and confidence, and no chance to check hands-on work. In our experience, most MTs need good face-to-face instruction to work safely and well with people with cancer. We know this because MTs tell us this, and because the many questions that come through our office are requests from MTs to drill the information down to a short list of guidelines. The principles and practices of oncology massage cannot be summarized in a sound bite, or two or three. Some MTs are able to teach themselves about this work, using webinars, books, and articles. These successful self-taught MTs start with strong hands-on skills, good body mechanics, and an ongoing time commitment to a depth of education. They tend to have a strong grasp of the sciences, and some experience with medically complex populations. If you go this route, be sure you are teaching yourself with everything you can find on massage and cancer. This includes whole books and chapters of textbooks, researching a growing body of articles on the topic, and good online instruction. If you want to specialize in oncology massage or make this population a focus in your practice, we strongly recommend face-to-face instruction with us, or with another provider who is recognized by the Society for Oncology Massage. I already see clients with cancer (Or, I’ve been in practice a long time.) Will this course be too basic for me? It probably depends on your experience and how much oncology massage literature you have read, but many seasoned MTs have taken this course and benefited from it. They receive reinforcement for the work they are already doing in the world, or go home with a stronger framework for their clinical decision-making with their clients. And almost everyone takes home new information and things to try with their clients. If you are unsure about whether the course is the right level for you, send us an email and let's talk by phone about your background before you sign up. Is 4 days long enough? Can I learn all I need to learn? We cover a lot of ground in 4 days. You will leave with a great foundation for your work. From here, you may go on to take related courses in hospital-based massage, lymphedema care, or even advanced treatment of scar tissue. But the 4-Day Intensive provides plenty for you to take, turn around, and get right to work. Will I be able to use the course information right away, or will I need more training first? The content and delivery are designed to be usable right away with clients. Our students report putting the work into practice the next week, with great success. Frequently Asked Questions about Oncology Massage in general can be found on our FAQ page. Questions about training dates, locations, tuition, and registration can be found on our Training Schedule page. For CE course approvals, check here. You may have questions about this course. If our Training Schedule page or the FAQ’s above haven’t answered them, then please send your questions to us in the form below, and we’ll answer them shortly. If your question is about dates, locations, or tuition, please look on our Training Schedule page first. If your question is about CE course approvals, please look on our Course Approvals page first. If you like, tell us which training are you thinking of registering for, at which location?